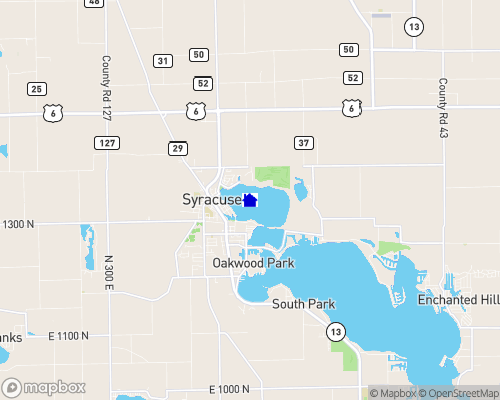 Lake Syracuse is bordered on the west by N. Front Street, Pickwick Road and the B&O Railroad on the south. On the east it is bordered by E. Shore Drive and on the north by E. Northshore Drive. It connects to Lake Wawasee by a channel on the south end. Syracuse Lake, like its neighbor, Lake Wawasee, is lined with many homes used seasonally and by those who live there year round. Largest natural lake in IN, spring fed. The area doesn’t slow down much in the colder months, as year-round residents also enjoy a variety of seasonal cultural events, snowmobiling, ice fishing, and ice boating. Syracuse Lake is classified as a Trophic Class 1 lake having eutrophication index value of 10. The lake is typical in structure of natural lakes of the glaciated portions of the upper Midwest. The lake is presently healthy and has balanced aquatic ecosystem (WAW 1995). It has a surface area of 1.67 km2 (414 acres) with a maximum depth of 10 m (34 ft) and an average depth of 3.9 m (13 ft). Lake Syracuse is famous for its variety of fish and fauna. Fishers can pull in bluegill, largemouth bass, yellow perch, banded killfish, brown bullhead, green sunfish and many more. Here you will find an oasis of spectacular recreational opportunities in beautiful northern Indiana. Ideal for any fresh-water activity, these lakes provide everything you need for a fun day in the sun. Enthusiasts of motor boating, water skiing, sailing, swimming and fishing have found Lake Syracuse to be the Mecca of Indiana's unspoiled natural environment. This lake is surrounded by several entertainment options in nearby Warsaw, Goshen and other surrounding towns. Residents enjoy numerous area golf courses, movie theaters and fine dining. Shoppers can also enjoy some very distinct local cultural opportunities provided by Amish Acres, Essenhaus and Shipshewana located nearby.